A fool’s bargain indeed; a k a the compromise-away-the-best deal. Wild places don’t need any more “deals.” They need the best protection conservationists can find. And that ought to mean closing roads, for starters. Side payments would be great, but there’s already mechanisms for conservation $$ – the problem is they don’t get funded, or the money gets siphoned off elsewhere. EPA restoration program $$ has been zeroed under the Bush Admin, LWCF is at record lows…you get the picture. I still think too many folks are fixated on wilderness designation. Locally, our designated areas get absolutely hammered. The really nice country is quietly unroaded, untrailed and undisturbed. As long as conservation management is practiced, these spots will be fine. The real problem lies in the rapid destruction of high-quality private lands which is permanently fragmenting the landscape. Roads can be removed, trees can grow back, range can be healed (most of the time). Once the mega-homes, pavement, dogs and bikers show up – it’s over for a long time. That’s part of what I am talking about, wilderness alone is not enough. 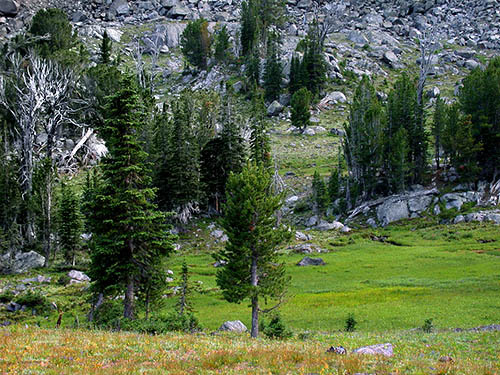 In addition to wilderness, conservation side-payments might be purchase of development rights by the government, or a quasi-governmental entity, in a nearby non-wilderness valley. The side-payments could be as in the original version of CIEDRA, the buyout of grazing permits on a large swath of public land. One of the big motivations for wilderness designation today, one which is making grazing and timbering at least partially temporary allies of wilderness advocates is the rapid increase in off-road vehicles. ORVs are dismantling many of the roadless areas. It seems that people who don’t own them tend to hate them, public land ranchers especially, even though they probably own some themselves. The biggest opponents of CIEDRA in Idaho were not conservationists who disliked the side-payments, it was off-road vehicle and snowmobile groups. Decent funding for conservation, whether through “side-payments” or whatever would be great; but, we have to keep in mind that the federal funding process works one year at a time and is politically controlled/manipulated each and every one of those years. You also need to remember that politicians, especially Republicans, are fundamentally untrustworthy; neither the truth nor any of even their own commitments mean anything to them. In the late 1990s, I spent a boatload of my time and money going back to DC to get commitments on funding for parks, wildlife refuges, and the land/water conservation fund. I got firm pledges from even Republicans that the money would come in a multi-year initiative that would frugally, but effectively, help deal with a very long, but specific, list that covered issues ranging from sewage spills in The Park to road closures to the purchase of inholdings and the consolidation of checker boards. Once the Cheney-Rove Administration got control, it was all either reprogrammed to rob Peter to pay Paul or gutted altogether. From my experience, if you want wilderness, get it locked down tight when you can get it or, if you deal for a “side-payment” instead, get it all upfront. Otherwise, consider yourself a fool. The very reason why the politicians want you to give up wilderness designation now in return for “side-payments” over time is that they know darn well that, with a wilderness designation, you get your share upfront; it’s a done deal and ORVs and snowmobiles and development are dead issues forever. But the politicians also know that, if they can get you to trade for “side-payments” stretched out over time, there’s practically no chance that they will actually ever have to live up to their end of the deal. They also know that, if they can get you redirected to focus on problems involving private lands, they can get you fighting a whole host of other villains and can see you divided and conquered. Yes, there are private land problems and limits to using wilderness protection to equate ecosystem protection; but, wilderness designation is extremely valuable, essentially permanent, and enables you to refocus other energies on other problems. With regard to multi-year promises, trust me; I’ve been there and done that. Fool me once, shame on you; fool me twice, shame on me. The GOP has already fooled us way more than twice and they’re still out there. You are absolutely correct. My experience says the same thing. Idaho U.S. Senator Larry Craig understood that too when he demanded payment first for the ranchers in the Owyhee Initiative (OI) before any wilderness was designated. I think these ranchers are slated to get far more than their land is worth in the OI, should it pass, but the principle is the same. As far as current appropriations go, Congress didn’t even pass a budget for FY2007. The entire year is going to be funded by a CR (continuing resolution).